Well after 14 years for me and 15 for muleyaholic we will be chasing rutting bulls in walla walla this september. How did every one else fare? No elk. :( Did get 615 so maybe a little extra sausage this year. Good luck on your elk hunt. That's a great tag. No tags in our household...0 for 17. This was only my 41st year applying for Oregon sheep, so I guess next year will be MY year. Wapiti06...yew ever been up in the Walla Walla? Hunted it in 2004 and helped a fella with a tag in 2008. Let me know if you need info. Hopefully next year treekiller the odfw will bless you with one. You sure got the time in applying . I've been over there looking arpund a couple of times. But never to hunt. So I will definatley like to pick your knowledge. We are really looking forward to it. May I ask how'd you do in 2004? I didn't get a bull, either out of my recurve range or in the jungle so thick I couldn't get a shot off. Awesome hunt, but also the toughest hunt I've ever been on! 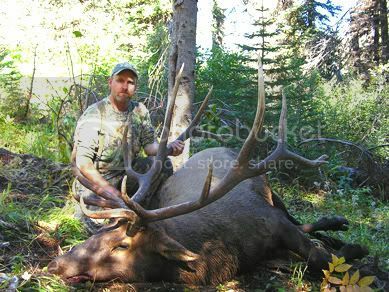 Here's a photo of me with my hunting partners 360 bull he killed with a compound. Yeah that country looks impressive. Muleyaholicand myself have been trying to throw the packs on and hit the hills for 5 or so miles a few times a week. And stump shooting sure makes the miles go by. And thst is a dandy of a bull. Ok after seeing the picture of tree killers hunting partners Walla Walla bull I'm dieng to go now. Hey Tree Killer what do you mean by the toughest hunt ever? The steep terrain combined with the jungle like brush where many of the bulls call home ... made for a "tough hunt"! I worked in the woods cutting timber my entire adult life, so steep ground and brush doesn't affect me much. But the hillsides with tag alder and yew brush so thick you couldn't see more then lower legs of bulls 15 yards(or less) away gets kind of frustrating. The heavy snow up there bends all that brush downhill, so going UP is nearly impossible. We eventually located several areas that were more conducive to killing elk. Then the last week of the season brought bulls wandering in from the Wenaha and the watershed in search of cows...it became a frenzy! One friend killed a 360ish bull last year in almost the same exact spot as the bull in the photo above. He killed it with a compound, but has switched to stickbows since then and I've made him several dozen arrows for his recurves. You guys will get spoiled this year! It's like the rest of the state used to be in the 1980's...bulls bugling all around you. I lost all my saved topo maps when my PC crashed last winter, but I'll try to get more to send ya. Treekiller all I can say is thanks. And muley we better get in shape lol. I was so hoping to see the phrase: "Successful for 255R1" on my ODFW controlled hunt summary...Oh well...it will be fun to tromp around in the Snake this year with my new Blacktail Elite VL and some of the sticks Tree Killer made for me. I had just about as much fun riding motorcycles around as I did hunting - so if you like to ride, it's a good way to be mobile. Nice bull Bryce. I really am looking forward to chase some of those guys around. Thanks for the links to the maps. Tree killer is sending me some maps also. Did you hunt the north fork or south fork? I hunted both and had good encounters with shooters in both. The thing that was very unique about the unit is how aggressive the bulls were. I had several encounters where a bull would come charging in to my calls. And, unlike my experiences in the Imnaha, the bulls almost seemed wary of cow calls. We got set up on one bull with about 15 minutes of light left and ultimately chased him out of the state trying to entice him with a cow call. I chatted with a local during one of my scouting trips that had the tag in 06' - he claimed to have bugled in 26 bulls during his hunt. If I get to hunt the unit again I would be reserved with cow calls and assertive with the bull sounds. 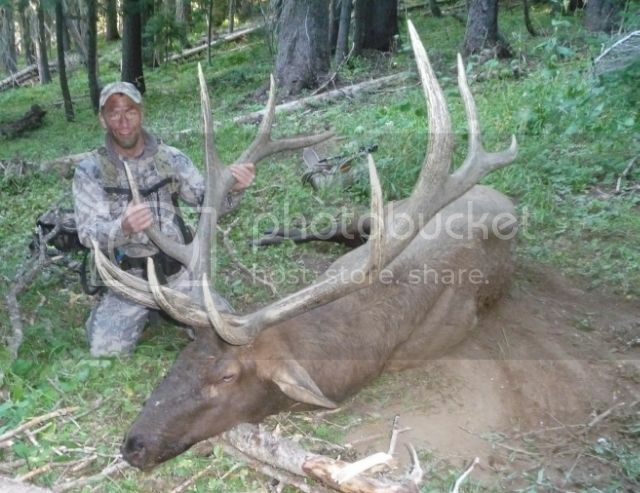 The head on your bull Bryce is huge just like the head on Darin's bull in 2004. Maybe it takes a big noggin to pack all that weight around? Speaking of weight...the bulls in WW and over in Wenaha are incredibly FAT! The two bulls I've been a part of have had 2" of fat on their butts and 5 gallons of kidney fat inside around the tenderloins. All the bulls I've butchered down in Grant County during archery season have been lean, mean rutting machines without a speck of fat on them. I have the maps printed out Shawn, just need to add the footnotes and they'll go in the mail. Been busy making arrows for Bryce and other fella's! Thanks so much. One of these days I'm gonna shoot some wood arrows. I haven't made no woods yets. Gold tips shoot great out of my recurve but getting the weight up is the only thing that scares me. But recently I took some 1/4" pex tube and got my arrows up to 555 grains. Just need to shoot tje heck out of them. Thanks for the update and your time. Any information is greatly appreciated. It sounds like we had better double time our work out regiment. So guys....how did your hunt turn out? I am sitting on 20 points and plan on the Wenaha in a couple years. Just started hunting with archery equipment, trad at that. Scott.